Sometimes to find good food, it requires traveling significant distances. I'm not talking about getting on a plane though. Rather, I'm referring to the large geographical area of the Lower Mainland. We are so spread out, it is a real challenge to try everything out there. On the other hand, if the food is special enough, the effort is well worth it. Therefore, I have no problem heading over to Richmond for a meal every now and then despite the possible danger to my car. Imagine how very special the food has to be if one was to travel all the way to Abbotsford. That was the dilemma we faced with Ah-Beetz Pizza. 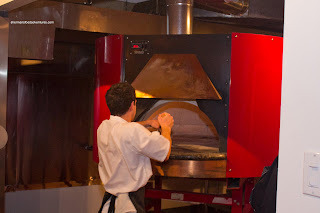 They had great Neapolitan-style pizza (to clarify, they had NYC-style pizza as stated in the comments, but as of now, I feel they are closer to Neapolitan-style pizza) before the fad hit the GVRD. It's really too bad about the location since it could never be enjoyed or hyped up. Terry Deane, the owner and operator of Ah-Beetz, eventually sold the place and made plans to open up shop in Vancouver. For pizza-lovers, that was long overdue and the time they took to finally open was excruciating. Although, Mijune and I really had no idea when it was actually opening for their first day of business, the night we decided to go happened to be their official first day. We realize that visiting a restaurant within the first month is never a great way to know what it will eventually be like, so it is always good to keep things in perspective. With a wood-burning oven and fresh pizza dough and quality toppings, we were anxious to finally sample Terry's creations. Of course we had to start with the classic Pizza Margheria (tomato, fior di latte, aged mozza, basil, parmigiano reggiano and EVOO. From our initial observations, the crust exhibited a fair amount of leoparding (blistering dark spots) which of course added an aroma in smell and flavour. I liked how they aggressively salted the pizza dough which is not always the case everywhere else. For some it might be too much, but I liked it. 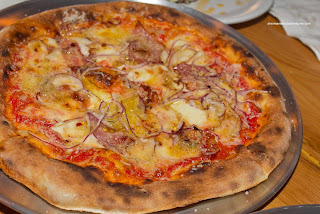 The crust wasn't exactly crisp (like the one from Pizzeria Farina) nor was it soggy (like the one from The BiBo). It was somewhere in the middle where it was more chewy than anything. For me, there was nothing wrong with that. 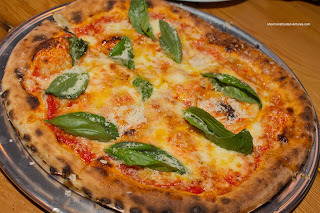 The tomato was mild tasting while the large basil leaves on top added a strong punch to the pizza. They weren't shy with the drizzle of EVOO on top which made the pizza slightly greasy, yet tasty at the same time. 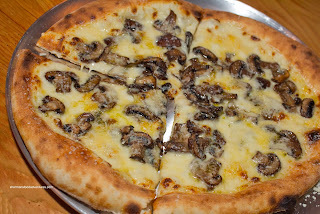 Although quite salty, my favourite pizza had to be the Funghi with bechamella, fontina, oven roasted cremini, parmigiano reggiano and white truffle oil. The flavour and Earthiness of the mushrooms and truffle hit me like a tonne of bricks. Combined with the bechamella, salted dough and parmigiano, this pizza did not lack flavour at all. Possibly to some, it might be too much flavour. Despite this, I like this just like the last pizza. 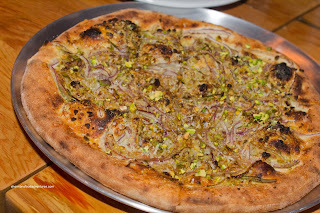 From my favourite to the one I really didn't care for was the Bianco Rosa consisting of red onions, rosemary, pistachios, parmigiano reggiano and EVOO. Okay, let me rephrase that. It's not that I hated it, it just didn't compare with the other 3 we had. There were good things though. Loved the sweetness of the red onions and the crunch of the pistachios. However, it was really dry and I didn't feel like I was eating a pizza. It was more like a flatbread with toppings. On the other hand, this pizza showcased how the crust could be without the influence of moisture. It was crisp, chewy and tasty. 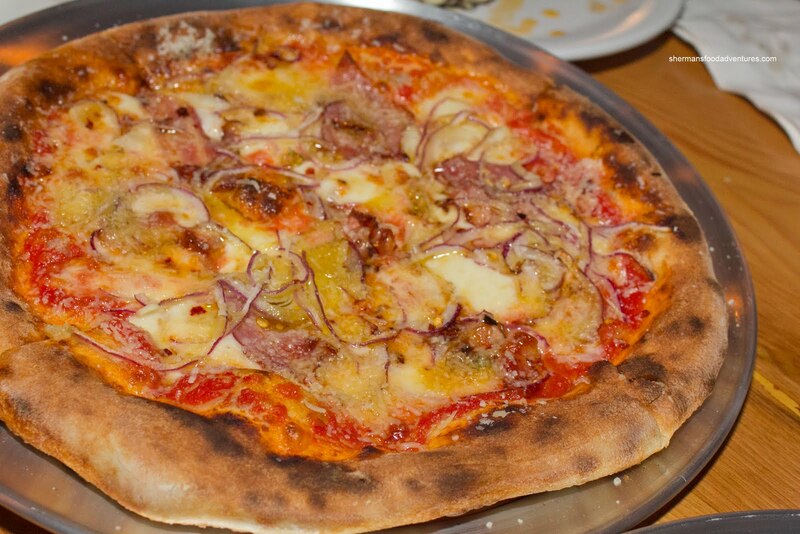 Our last pizza was the Amatriciana topped with tomato, fior di latte, aged mozza, house smoked pancetta, red onions, fresh garlic, chili flakes, parmigiano reggiano and EVOO. This was a solid pizza with many different flavours in play. From the saltiness of the pancetta to the bite of the chili flakes, it had it all. So was it worth the wait? Yes, yes it was. Although I still crave the pizzas from Pizzeria Farina the most, Pizzeria Barbarella sets itself apart from the other Neapolitan pizza joints by making many of their ingredients in-house, having reasonable prices, lacking pretentiousness and producing a competitive pizza to boot. For some odd reason, I am under the impression Terry's pizza are NYC style pizza rather than Neapolitan pizza. 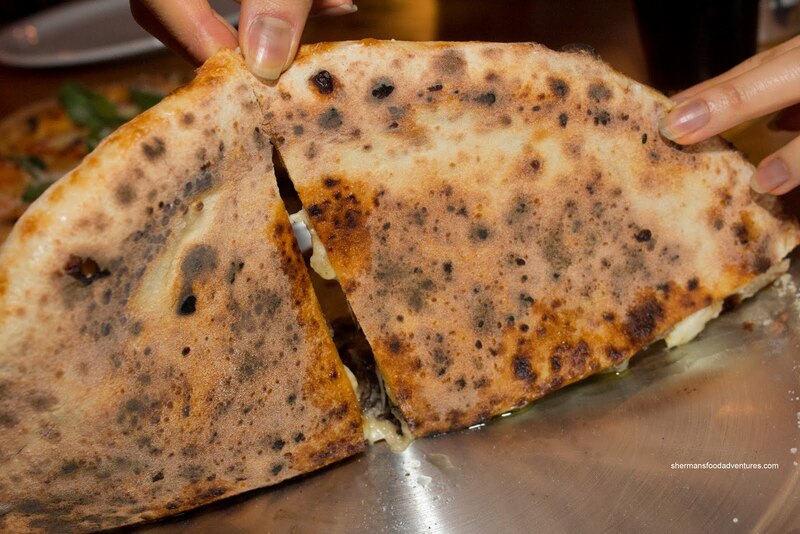 Of course, it could also be a hybrid between the two given the size (Neapolitan pizza) and how foldable and chewable it is (NYC style). Yah, that's what I thought, especially remembering what I had at Ah-Beetz. However, it seems more like a Neapolitan-style now. Also, that's why I used "Neapolitan-style" as a description since it bears a striking resemblance. 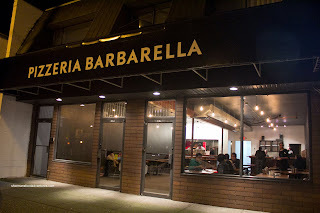 How are their prices compared to Farina, BiBo, Verace, Nicli Antica etc ? @LR I would say the prices are very close to Farina. Which makes it a good value considering the quality of ingredients and execution. Menu is on the site. Hi Mr. Deane, I've not tried your pizzas but am dying to. One day, soon ..... ! Wondering if you'd be interested in making both NYC *and* Neapolitan styles. The only other place in town I'm aware of (and enjoy) who makes NYC-style pizzas is Nat's New York Pizzeria on the west side. Hi Terry! Yes, you did very well for opening night! As with anything, things only become more refined and better as time passes. I am confident that this will be the case. Congrats and may your pizzas be enjoyed by many in the coming years. Oh btw, I didn't mind the salt personally. @LR Go try it NOW. Which was your fave pizza of the night? Any other pizzas that you would try next? 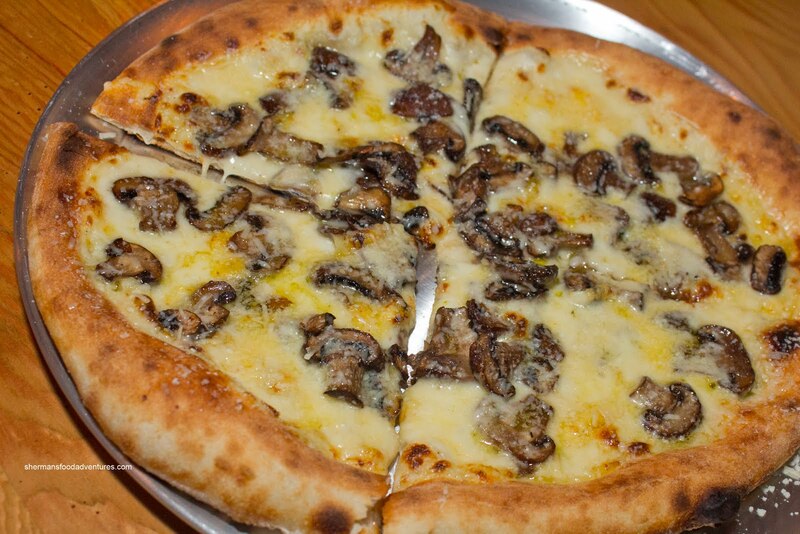 Think one of the first pizza I would try when I go to Barbarella would be the Funghi one. I'm getting away from the tomato sauce types. Thanks for the review. Went to the place tonight to try it out. SALTY says it all. It was acceptable to me, but my companion was complaining about it the entire night. I guess people just have different tastes. @RR I like the Funghi myself! Not sure which one to try next... Maybe the Diavola? @Anson I'm glad that I'm not the only one who thought that. But just like you, I enjoyed it nevertheless.